Am I oriented enough yet? I just spent my morning at the University of Rochester new employee orientation. Yes, it was about as exciting as it sounds. Since I am only a temporary employee, and am not working at the hospital, most of the information had absolutely no relevance for me. I mean, I certainly hope I will not be dealing with hazardous materials or bodily fluids. And what I really need to know - do I need to get an ID card, for example - was not answered. Hopefully that will be covered tomorrow, when I have to go for a meeting with the staffing people at the university-run temp agency. Thank goodness I didn't have to stay for the afternoon session! Why is it that orientations never actually give you any usable information?! Yes, that's right, I am now (or will be as of next week) employed. Doing what, you ask? Beats me - general office stuff mostly, 20-25 hours a week. Not archiving, alas, although I should be able to continue my volunteering at the Brockport archives. Still, paid employment is good, and the people I met in my interview seem nice. And it is at the Eastman School of Music, so even if the work isn't thrilling, it is in an interesting building, with piano chords coming through the walls. 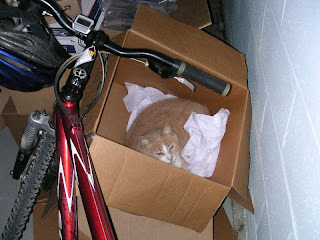 In lieu of a relevant picture, here is one of Creamsicle, who is eschewing the comfortable, warm sleeping places of the upstairs for a tissue paper filled box in the basement. The water heater is installed and working, although it took the installers twice as long as predicted, due to some electrical issue (which may or may not be relevant to another issue that I will get to in a minute). Yay. We can shower in our own home again, and run the dishwasher! Now, however, several of our plugs in the living room don't work. We were sitting down to watch Jeopardy last night, and I decided to turn on a light too, because it was getting dark. As soon as I did so, both the light and the TV went out. We traipsed down to the basement to check the circuit breaker box...to find that all the switches were where they should be. One of them should have been switched off. Hmm. Ben switched some of them off then on again, while I stood upstairs, yelling down which lights he got with the switch. Turns out that the switches aren't labeled correctly, and some don't appear to do anything, but might - we just don't have anything plugged in to the plugs. My big fear was that there was a short that was going to cause a fire and burn us out of house and home. A call to Ben's very knowledgeable dad (he built an entire house all by himself, including the electrical wiring) soothed those fears (if it was going to start a fire, it would have probably done it right away), but that doesn't solve the dead plug problem. Anyway, it may have something to do with a bit of rewiring that the water heater guys did, but it might not. More waiting. Can I just say again how much I hate waiting? I hate waiting, any kind of waiting. 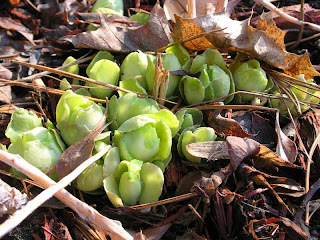 To find out what will happen at the end of a book, to find out if I or Benjamin will have a job, for a new water heater, even for these spring buds to come up. I know there is joy in anticipation, and that delay can make the event all the sweeter, but I hate the pit in my stomach that comes from waiting. At least the sun is out and the predicted snow last night came as rain instead. Other than that, it is unseasonably cold here, and our water heater is broken. I am waiting for the landlady and a plumber. Whee. As my long time readers will know, I have been struggling to find a yogurt brand that I like up here. In Austin, I bought a local brand that came in glass jars (oh how I regret not keeping more of them when we moved - they are really useful) or in gallon-sized recyclable jugs. One of the perils of eating local is that when you leave a region, those products aren't available, and so it was with my yogurt. I used the store brand for a while, but only in my smoothies because it didn't taste very good plain. I tried the big organic brand, which tasted a bit better but was more expensive and still not all that good - not very much taste or tang. I tried to wait and only buy yogurt when I went to the natural food store, but that was inconvenient and although I like the Wallaby yogurt brand, it still was not quite what I wanted. And no matter what brand I tried here, it was in plastic containers that are not recyclable, made from milk from far away and shipped here. However, I discovered that the natural food store carries milk from a local dairy, and found a good solution: I asked for a yogurt maker for my birthday, one with glass jars instead of plastic. When I was very small, my mother made yogurt for me, and I have had several people recommend this course of action now. My birthday is still a few weeks away, but Dad didn't want to wait, so it arrived in the mail last week. Yesterday I made my first batch, and this morning I tried out the plain (I also made a couple jars flavored with jam - haven't tried them yet). It was very good! Tangy, good consistency, glass jars. Exactly what I wanted. Yay! We had a good drive over to New Hampshire on Monday, with lots of sun. Because the weather was nice, we took a scenic route up close to the Adirondacks and through the middle of Vermont and the Green Mountains. I have to confess a little bit of disappointment at the size of the mountains we could see - I was expecting something more craggy, more...well, more like the Cascades or Rockies. A bit unreasonable, really, since the mountains on this side of the country are a lot older than those in the west. And we weren't really going through the wildest parts either. Still, despite that minor disappointment, it was nice to be back in hills and mountains. Brockport isn't bad, but it is certainly not hilly. On Tuesday we had a nice tour of the campus - it is small enough that we looped it twice in about 35 minutes - and I got to wander town and see what there was to see. Anyway, it was good that we had that sun and that we got to see some of the area, because the drive back on Wednesday was the complete opposite. It was snowing as we left the town; that turned into steady rain combined with patches of dense fog. The fog disappeared as we descended out of the mountains, but the rain was with us until Rochester. We missed several scenic viewpoints because of the fog, and gave up any ideas of sightseeing in Bennington or elsewhere because of the general miserableness. Here are a few pictures from the trip. The top one is the president of the college's house. See the giant snowbanks? Apparently, those don't go away until late May or early June. The second picture is, I assume, a syruping bucket. All the maples that lined the front entrance to the college had them. Cool. I don't know what the college does with the syrup - use it in the dining halls? Send it to incoming freshmen the way Whitman sends onions? The final picture is the view from Main Street, right in front of the college, looking out across the valley to the nearest ski area. There are 4 or 5 within an hour's drive, and plenty more reachable in only a few hours. Students get a free ski pass included with tuition - one student we met said that was the reason she chose to go there. Faculty don't get free passes, but do get a generous discount. 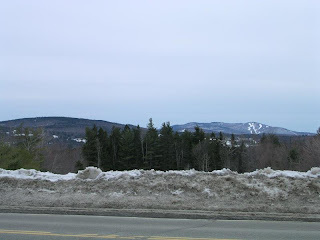 I am not sure how I feel about New Hampshire yet - the fact that spring was at least another month away is daunting, but the chance for skiing and lots of summer hiking is pretty nice. Well, it isn't up to me yet, and may not ever be. Now we are just playing the waiting game. Although, unlike for the wicked witch, it is a good thing. A week after being buried in snow, we are now melting. Well, the snow is anyway - it is only 40 after all, not the 95 it was in Austin yesterday. Spring is truly on its way now, even if winter has a couple more storms to throw at us (not that I would be disappointed if it didn't). The soundtrack to my walk yesterday was the steady drip of melting snow and the twittering of birds. This afternoon on our now-weekly walk to the library we saw a small flock of waxwings in a fruit tree, eating the berries that still hung on the branches. Hooray! Happy 3.14 day! The day when math geeks celebrate the joys of the calculation of pi. Here is the official web site for the day. In other news, Benjamin finally made it home from Arkansas - after being stuck in the Little Rock airport for 10 hours. His plane was indefinitely delayed due to some mechanical problem, and the time of departure just kept going back and back. Finally, they put him on standby for a flight, and he was the last person to get a spot. Made it home at 11:30 - he was supposed to be here at 5. And to make matters worse, he had checked his bag - for the first time in years. Our general rule is to never travel with more than we can carry on, and to carry everything on. But, this time he figured it would be a quick trip, so he checked his bag. On the chance that the suitcase made it, we had to wait another 30 minutes after he arrived. One by one, all the bags on the carousel were claimed, and his never showed. The baggage guy said it should arrive today or tomorrow, and it will be delivered. It had better come, because Benjamin needs his suit again next week for another interview. In the words of the immortal Mal Reynolds: "It never goes smooth. Why don't it ever go smooth?" Those of you among my loyal readership who live in the Seattle area (3 of you?) should consider going to the Green Festival next month. 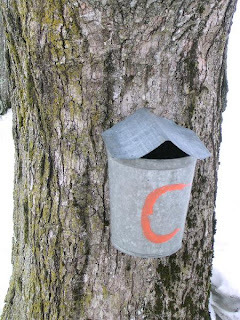 It is sort of like a home and garden show, with an organic and sustainable living focus. There will be lots of interesting talks, and vendors with all sorts of neat products and suggestions, and I am sure they will be willing to show you how to convert your car to run off coffee grounds (well, maybe not that but plenty of other stuff). Benjamin and I went to one a while back in Austin and really enjoyed it. If you are at all interested in living with a smaller footprint, GO. Well, our miscreant, former crime fighter, governor has resigned. Obviously we didn't vote for him, since we didn't live here back then, but I probably would have. I admired him for going after big businesses and crime when he was state attorney general, and until yesterday thought he was doing an OK job as gov. But $80,000 on call girls, while governor? And he was caught by procedures he set up! That is just beyond stupid. David Paterson, our new gov sounds interesting, at least, and will be the first African-American governor of the state, and is legally blind. Interesting, no? You know how it is when you learn a new word and all of a sudden they appear everywhere? I am having a similar feeling about Iceland and Bhutan. Until recently, I never thought much about these two countries, but lately they have been showing up everywhere. Iceland first came into my head when we visited Chris and Mulzer at New Year's. They both lived there after college, and had books and magazines about Iceland in their apartment. I first heard about Bhutan and its policy of Gross National Happiness a couple of years ago when I read Michael Palin's Himalaya, but haven't thought about it much since. Well, in the last few weeks, they both appeared in National Geographic, Smithsonian, and a book I read, The Geography of Bliss. I also found a mystery novel at the library by an Icelandic author (I brought it home to read, but several bad reviews and a slight lack of interest mean I probably won't be reading it after all). Strange. Are they suddenly hip countries to talk about, the way a certain food becomes suddenly hip? Or am I just noticing them more? Addendum: Now that Benjamin is interviewing for possible positions, the same thing has started happening with Little Rock and New Hampshire. Did you know that Adam Sandler was from NH? Or that Little Rock is considered one of the greener cities in the country? We are still digging out from under the weekend storms. Well, not us personally, since we got the driveway cleared on Sunday, and that is all that really matters to us, but the area in general. 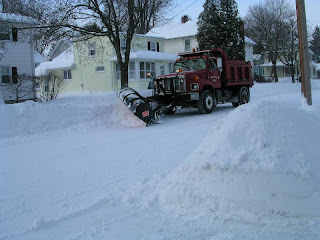 This morning when I returned from taking Benjamin to the airport, Main Street was closed so that the Public Works guys could use big machines to remove the accumulated snow. They scoop it into the backs of dump trucks, in which it is driven out into the countryside somewhere and dumped. On Sunday afternoon, after the snow stopped falling and the sun came out, we went for a ramble about town. We went down a new (to us) street and found the above cemetery. It looked a lot like some sight out of a Russian movie, the steppes or the prairie. 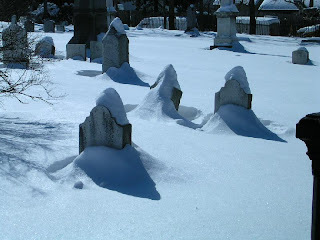 The whole cemetery was covered in a deep layer of snow, and the wind was blowing across, stirring up clouds of snow. Cool! 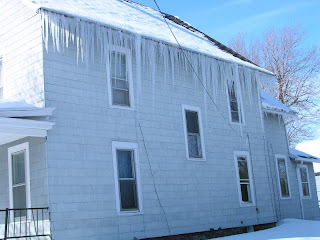 And check out the icicles on the house below - some of them are close to 3 feet long! These are just the most impressive - most houses, including ours, have a least a couple. I took too many pictures of them, but I have never lived anywhere with icicles. OK. We have now had the big snowfall I wanted, and now I don't want it anymore. 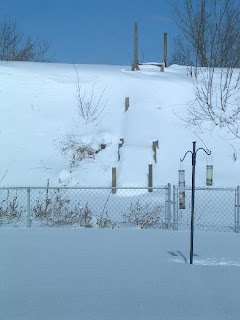 Since Friday afternoon, we have had approximately 18 inches of snow, maybe more (it is blowing around so much that it is a little hard to tell). It isn't so much the amount of snow, exactly, but the timing of the storm, and the fact that I am really ready for spring. The first of those complaints - the timing - is because Benjamin was supposed to be flying out of Rochester this morning, headed to Arkansas for a job interview. When we checked the airport last night - more than 12 hours before the flight - it was already canceled. So, instead of having a relaxing Saturday night, we spent a whole bunch of time on hold, trying to reschedule or get him another flight out today. And then we had to change our clocks, which is trying enough on a normal weekend. Urgh. Since we couldn't get anything sorted out last night, we had to go at again this morning (I keep saying we, but mostly it was Ben - I was out shoveling snow so we could get out of the driveway if we had to make a dash for the airport). After several hours of being on hold, and frantic emails to the contact at the interviewing school, everything got sorted out. As for the second complaint against this storm, that I am ready for spring, is a bit unreasonable for this area of the country. 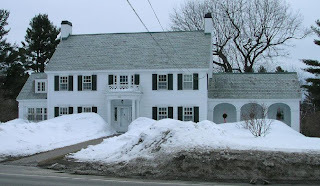 According to the local weather people, March is often the snowiest month of the season, and so far, it is indeed living up to that appellation. Even so, I am now tired of winter. I have tried to remain positive about the gray, and the snow, and the cold, and the blowing wind over the last few months. I remind myself that for the last six years I have griped about how I wanted a real winter - well, now I have had that winter, and I want it to stop. As I moaned multiple times yesterday, if we were in Walla Walla, it would be daffodil time. And if we were still in Austin, it would be almost time to start picking strawberries. So, that's my demand - spring. Soon. Please. It is a snowy Friday afternoon here in Brockport. In contrast to Monday, when he was in shorts, the mail man is all bundled up, as is my neighbor who just left to walk his dog. I will be too, in a moment, because I am going out for a walk in the snow (should have gone right after lunch, before it started, alas). We are going to a play tonight - good thing it is at the college at the end of our street, so we don't have to drive anywhere. Benjamin leaves for Arkansas on Sunday, for an on-campus interview. He has another one the week after in New Hampshire. I get to go along for that one, since we are driving. Whee a mini-vacation! We ordered his graduation regalia today, even though we aren't yet certain we will be going to Austin for graduation. He is a PhD now, anyway, and will need it occasionally. Contrary to what I believed when I first started college, however, the regalia alone is not enough motivation to get a PhD. I should go walk before I need snowshoes to do so. I just finished reading In Defense of Food by Michael Pollan, and found it rather anti-climactic. It isn't that it was disappointing, exactly, or that I disagree with it, but rather I think it was that I have already heard everything he had to say. I mean, I have read a bunch of reviews and interviews with him, so I already knew about his little mantra to help you learn to eat real food. And I have read several of the books he quoted extensively as sources, so those sections were re-treads. And I already know that it is better to eat real food, and not to rush, and to avoid high fructose corn syrup like the plague. I think also that I was hoping that this book would have the same quirkiness and personality of The Omnivore's Dilemma or The Botany of Desire, and it just doesn't. It is much shorter, and what seems to have been removed isn't substance, but some of the style. One last nit to pick with Mr. Pollan - in his recommendations, he is obviously writing from California - a place where farmer's markets and CSA (Community Supported Agriculture) groups operate all year round. "Go to a farmer's market for all your produce." Well, we could sort of do that in Austin - at least the market was there all year - but not here. Our farmer's markets shut down in October and doesn't open again until May. The Public Market in Rochester has some "fresh" and local foods, but a majority of the food for sale comes from wholesalers. So, because we didn't/couldn't plan ahead and freeze things as they came available, we have to buy our produce from the supermarket. So, there is my review. Any thoughts from those who have also read it? The NY Times has an article today about yet another "memoirist" who fabricated almost all of her book. I haven't read any of the books mentioned in the article, but the argument posed by the author in this case rings false to me: "I just felt that there was good that I could do and there was no other way that someone would listen to it." What about writing a novel - those have been known to have a large impact on people. Or doing an extended investigative journalism piece? Why fabricate an entire history that was eventually brought down by the author's sister? Did she not think anyone would ever find out?! I accept that anyone writing anything other than a purely factual, documentation based biography will have elaborations and some fabrications - who has a perfect memory? - but that is very different than making up an entire past. If it is a compelling story as memoir, it should still be a compelling story as fiction. If not, and the interest in the story was simply because it was "true," then it probably wasn't any good to begin with. Tomorrow at this time, it is supposed to be 30 and sleeting. Ditto for the rest of the week, minus the sleet. Sigh. Yesterday, Weekend Edition Sunday had a piece about SUNY Brockport and some e.e. cummings painting and drawings that the school owns. Didn't hear it? Here is a link to the story, and while you are there take a look at the pictures in the electronic gallery. My favorite is the painting of the vase of flowers and the view out the window. Benjamin is off this afternoon, after classes, to Hamilton NY, and Colgate University for a day of interviews on Tuesday. Good Luck!